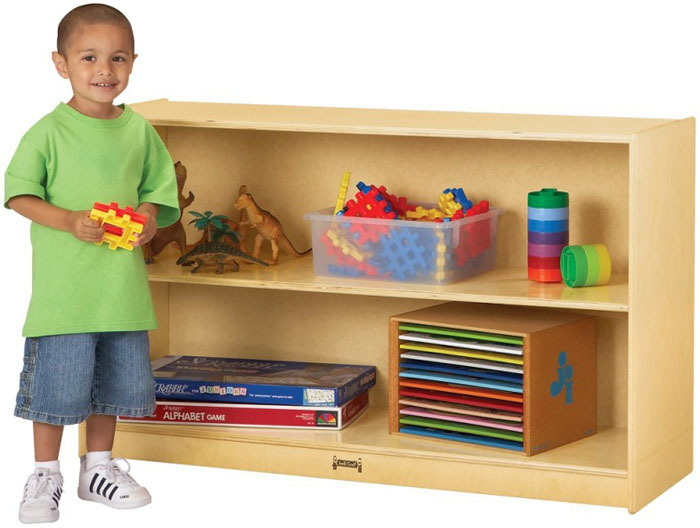 Two generous, fixed shelves provide roomy storage for large objects. Low height provides useful tabletop surface. Recessed, hardboard back. Caster mounted for ease of movement. KydzSafe® rounded edges and corners. KydzStrong® construction. Extra durable, non-toxic and lead-free KydzTuff® finish that will not yellow. This unit ships fully assembled and includes a lifetime factory warranty. 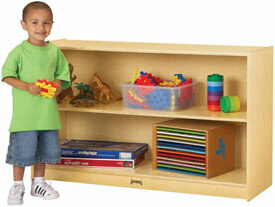 LOW STRAIGHT-SHELF MOBILE UNIT: 48" Wide x 15" Deep x 29½" High, Shpg. Wt.= 70 lbs. What makes this classroom furniture environmentally safer? Click for info..